Wellness strategist Dawn Burnett has an impressive track record for helping people unlock better health and greater vitality. Like all of us, however, she has had a life filled with highs and lows. The child of divorced parents and a survivor of abuse, she was in a toxic marriage and then, just after her divorce, was hit by a drunk driver. These events, and the discovery that her son had a life-threatening condition, led her to a wake-up call. Studying to become an alternative medical practitioner to heal her child, she also sought answers on how to heal her own life. Along the way, she charted a course to ultimate wellness on a path filled with valuable lessons, deep wisdom, and insight on a variety of issues—including personal relationships. She recognized that becoming trapped by the toxic emotions of our past can weigh down our spirit and sabotage any chance we have at happiness today or in the future. The result is Connect, a light but powerful little book that provides humorous yet effective ways to address key issues facing serious relationships. Filled with personal, engaging stories, complemented by captivating illustrations, it reveals: the pitfalls of dating in the digital age; the many ways we unintentionally sabotage our relationships; why we find ourselves choosing mates from the never-ending 'carousel of losers'; and how we judge ourselves—and others—without mercy. The antidote is a simple, empowering plan readers can implement themselves to heal their own hearts, pinpoint their true dreams and desires, and find meaningful and lasting bonds with their partners — whether they have already met or are still looking. This amazing little book is big on success, and will help readers finally attain what they outwardly say they want—without the emotional resistance associated with trying to change their partner. I recently traveled to Beverly Hills with my date, my handsome blond-haired, blue eyed eleven-year-old charmer. We had just arrived back at our hotel and were sitting poolside, cooling off with a drink—non-alcoholic for him, of course—when out of nowhere came a pushy dude wearing a suit, trailed by a skinny, long-legged blonde. He looked at me and shoved over an inch. 'Do you want something to drink?' he asked. My date, being the bubbly social type that he is, was busy talking the night away with some Scottish tourist who I later learned was a very intriguing and spiritually awakened man who suffered some serious health problems at a young age, causing harm to some of the 'family jewels.' But we'll talk about body parts later. As my son excused himself to the restroom, Mr. Pushy Pants started a conversation with Scotty boy. Before I had time to remove the fuchsia paper umbrella from my drink, Ms. Skinny Blonde began peppering me with questions, which led into a longwinded drama worthy of the Broadway stage. Even though I had only known her for thirty seconds, she began sharing her whole life story, and gave me the complete rundown of her string of recent boyfriends, their considerable faults, and how they had been completely wrong for her. I just nodded and took a bite of my pineapple skewer. As she continued to offload on me about her current dating situation, as if I was a columnist for a dating newspaper, she told me about her husband's battle and death due to cancer. Although I felt I empathized with her loss, all I wanted was to relax and enjoy the rest of my evening—and not get drawn into a total stranger's drama—but she kept chatting. She said she was all set—with her career and moneywise—but then up popped this opportunity (opportunity in dating, that is). She offered, 'Why take a breather?' As if being single is a bad thing. Oh here we go, I thought. I know where this conversation is heading . . . it's complicated. Yes it was. Anytime someone tells me they need to be with someone instead of finding happiness being on their own, it's always complicated. Then she dropped the bomb. She confessed that she was now dating a married man. She asked me over and over how I felt about her dating a married man, and why I felt she was making that choice. Her desperation and level of detail seemed to grow with every glass of wine, which, at this point, was likely the better part of a bottle. Maybe she saw the look on my face as she f?lagged the bartender down for another round, so she told me, through highly slurred words, that she 'used to not drink much' until she met Mr. Pushy Pants. A bell rang in my head. DING, DING, DING—that's the emotional and physical health railroad crossing bar dropping—STOP! If you are doing more of something that's not benefiting the quality of your temple, in other words, your body, then it's time to step aside quietly and examine your actions. I had an imaginary counseling session in my head with Blondie, even as I nodded my head and tossed in an occasional, 'Oh, really? Oh yes, I'm sure,' as she droned on. Do you drink more with your beau because it's more fun, or does he just seem funnier, smarter, less pushy and more charming when you are under the influence? Are you trying to keep up with his level of drinking so you won't notice that he is actually drinking most of the time? Or are you drinking so much because you know what you are doing is wrong—on so many levels? I get it, I thought, I'm not judging, just encouraging you to go a little deeper with your personal development thought process and really think with the left side of your brain as to why this guy makes sense in your life. I looked at Blondie again. She was pretty, no doubt, and seemed fun—probably more fun when she wasn't so inebriated—and apparently financially set. If I had met Blondie six years earlier, when I first got divorced, I wouldn't have understood why someone could jump from person to person. But now that I have progressed in my own healing journey, I understand more of why and how people make the dating mistakes that they do. Blondie explained that she was lonely and asked me how come I was not after six years of singlehood. I answered, 'Loneliness is a state of mind. I keep myself very busy filling my time with things that are most important to me,' like taking time to write this book. As I ventured out into the world of 'dating,' I began to see all kinds of dysfunctional patterns that people were repeating. No matter how much I tried to overlook them the patterns just kept showing up and that's when I knew I had to be a voice. We live in a reality TV world. Aside from the battling housewives and people trying to survive in the jungle with no clothes, there are the many that focus on dating and finding that 'perfect' match—all followed closely by the ever-watchful eye of the camera. Call me crazy, but it's just not the real world. What makes for good television usually makes for a bad life. I couldn't escape the drama of Blondie fast enough, because her story became like a broken record, one that I don't care to play in my house. Sure, I wanted to help her—that's the caring side of me. It seems that no matter where I travel, people open up and start to share their problems with me as if I'm their therapist or something. The reality is that the teacher will appear when the student is ready. As Blondie started making out with old Mr. Pushy Pants in front of my boy—and everyone else who had to see them, whether they wanted to or not—it was clear she wasn't ready. This is one time I was grateful for handheld electronics and gaming! Thankfully for all of us, the locked-lip couple took it upstairs to their room. After a long and amazing day preparing for and attending the ESPY Awards, all I wanted was some Zen time in front of the pool fire pit with my glass of bubbly. Ask and you shall receive. The Scottish tourist was now free from Mr. Pushy Pants and inched his chair over toward me to start a much more enlightened conversation than the one I'd just had with Blondie. He had a delightful brogue that was captivating to listen to. Moreover, it turned out that he was a very aware man who had recently sold everything back home to take his sister and nephew on an amazing month-long trip to live his dream of a more awakened and aware life. He had survived numerous health problems, and he embraced the truth that life is short and tomorrow is never promised. I thought, Now this is a man who gets it! Our conversation was easy and effortless, flowing like the warm breeze. But life is about balance, and as he excused himself to the restroom I excused myself upstairs. He looked truly disappointed and asked me not to leave, explaining that he enjoyed my company and the depth of spirituality. I thanked him for the lovely conversation and, with gratitude, gave him a hug good night. I walked away hand-in-hand with what mattered most to me: my gorgeous blue-eyed boy. ©2017 Dawn Burnett. All rights reserved. 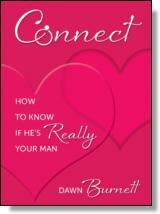 Reprinted from Connect: How to Know if He's Really Your Man. No part of this publication may be reproduced, stored in a retrieval system or transmitted in any form or by any means, without the written permission of the publisher. Publisher: Health Communications, Inc., 3201 SW 15th Street, Deerfield Beach, FL 33442. Dawn Burnett (Orlando, Florida) is founder of A New Dawn Natural Solutions and the co-host of the radio show Wake Up and Listen. She provides wellness strategies to those who are frustrated with their current health situations and are ready to embrace alternative healing solutions, healing their bodies—and their lives—from the inside out. She has an impressive roster of television and speaking appearances including Fox and TBN, and is a regular contributor to the Huffington Post. Dawn is the author of True Confessions of the Heart and is co-author of Jack Canfield's The Road to Success, Vol. 2.